9/6/2016 | Scented Splendor: The art of KAKUREZAKI Ryuichi & ISHII Takahiro — dai ichi arts, Ltd. Tradition is extremely important to Japanese culture, and it is a place where families can pass traditions down through many generations. Craftsmanship is perfected and protected within families. While many songs can be sung to praise such a long lasting tradition, the burdens of such a legacy can be an obstacle to new innovations and artistic breakthroughs. Noted ceramic artist Kakurencaki Ryuichi is not from Bizen nor is he from a longstanding potter's family. His unique outsider background gives him a totally different perspective and approach - he is able to look and create things anew, unburdened by tradition. This extraordinary incense burner has all the beauty that Bizen ware can offer, and yet the form is completely unprecedented. A very careful and considered placement in the kiln has resulted in a full spectrum of ash deposits: grey, brown, purple, and beige. The metallic wood lid could not have been carved better by a master; it perfectly completes the piece. As one of the six ancient kiln sites, the firing techniques and clay deposits of the Bizen community are tightly guarded. But even as a total outsider, Kakurenzaki Ryuichi has won the acceptance of the community and has inspired and paved the road for many outsiders to follow. Like Kakurezaki Ryuichi, his student Ishii Takahiro has taken Japanese ceramics by storm. A graduate from Kyoto Municipal University of Art, Ishii is the recipient of many ceramic awards. 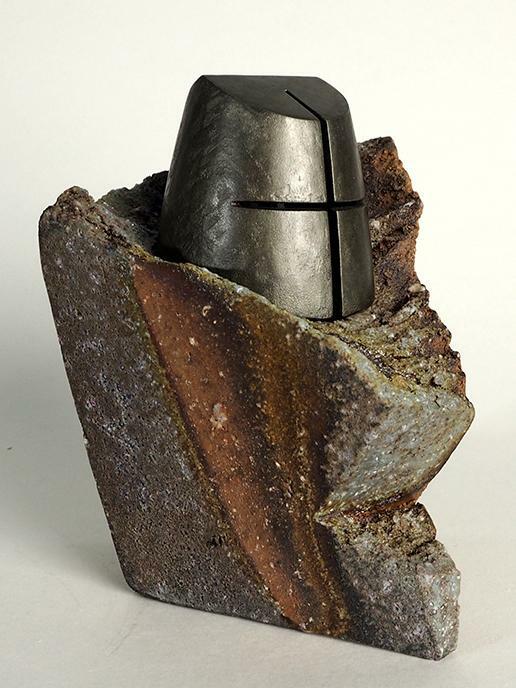 His unique incense burner is a ceramic slab that was fired in a covered environment where he carefully oxidized part of the surface to a black color, and finished the piece in graphic white glaze. A perforated ingot of brushed aluminum has been placed at the center to allow the perfumed smoke to exit. Both Ishii Takahiro and Kakurenzaki Ryuichi have given the centuries-old tradition of incense a fresh and new energy.